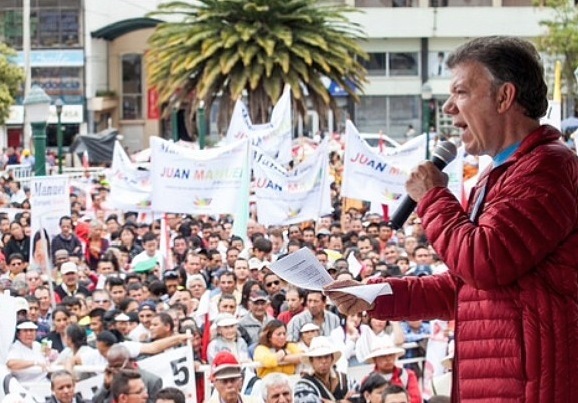 Two months ago, Colombia’s president Juan Manuel Santos, a former defense minister, who launched the most wide-ranging peace talks with the Fuerzas Armadas Revolucionarias de Colombia (FARC, the Revolutionary Armed Forces of Colombia), looked like a lock for reelection. Since late March, however, Santos has flatlined in the polls and his conservative rival, Óscar Iván Zuluaga, has nearly doubled his support — to the point where Santos and Zuluaga are now tied heading into the first round of the presidential election on May 25. Some polls show Zuluaga outpacing Santos in the runoff vote, which will take place on June 15 if, as widely predicted, no candidate wins a 50% majority this weekend. The race has largely (though not entirely) become a referendum on the FARC peace talks, the most serious attempt by any Colombian government to seek a truce with the guerrilla movement since it began in 1964. Santos has become the ‘peace’ candidate, arguing that the negotiations are making steady progress and that voters should give him a mandate to continue the talks. Zuluaga and his political mentor, former president Álvaro Uribe, argue that it’s wrong to offer incentives to FARC leaders, railing that they belong in prison, not discussing the possibility of winning seats in Colombia’s Congreso (Congress). 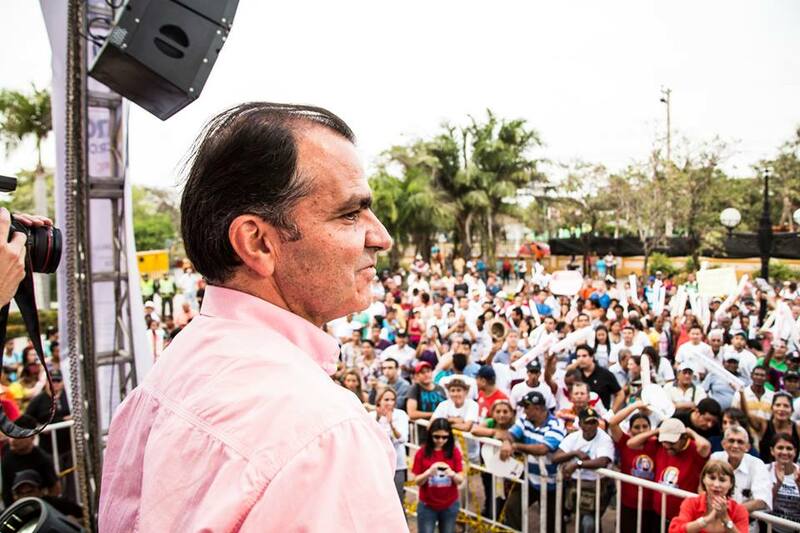 Zuluaga’s election would impose new conditions on the peace negotiations that would almost certainly bring them to an abrupt end, and he would return to the military-style campaigns designed to eradicate and eliminate FARC that were common in the Uribe era. Though Uribe presided over the widespread pacification of Colombia in the mid-2000s, Santos has argued that the FARC has been so weakened that it’s time for negotiations. Most Colombians long ago lost patience with FARC, which has increasingly turned to drug trafficking to finance its Marxist guerrilla activities, and most Colombians also lost patience with the drug-financed right-wing paramilitary units that sprang up in the 1980s and 1990s in resistance to FARC. Voters seem willing to support Santos’s efforts to normalize relations with FARC if the talks will end the violent standoff for good. FARC, for its part, seems to be working to bolster Santos’s political standing, declaring a unilateral ceasefire between May 20 and May 28, and working to complete the third of five issues-based agreements this week. 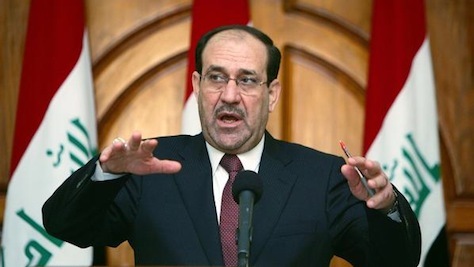 The accord addresses controlling trade in illegal drugs. Zuluaga and Uribe argue that it’s unwise to discuss drug policy with FARC, but Santos has argued that this accord in particular could eradicate what’s left of the illegal coca trade in Colombia. In an Ipsos poll conducted between March 14 and 16, Santos (pictured above) led with 24% of the vote, while Zuluaga was tied in second place in single digits, along with the candidate of the Alianza Verde (Green Alliance), Enrique Peñalosa, and the candidate of the Polo Democrático Alternativo (Alternative Democratic Pole), Clara López. With 19% of survey participants proclaiming they would cast a blank vote and with another 27% of voters undecided, however, the race was still fluid. 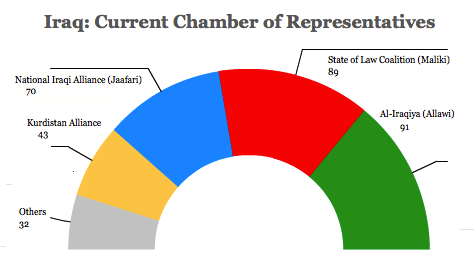 In an Ipsos poll conducted between May 13 and 15, Zuluaga led with 29.5%, with 28.5% for Santos, 10.1% for López, 9.7% for the candidate of the Partido Conservador Colombiano (Colombian Conservative Party), Marta Lucía Ramírez, and just 9.4% for Peñalosa, whose support was rising in late March and April. It’s been a particularly brutal fall for Peñalosa, who was the only candidate throughout the spring who seemed able to defeat Santos in a runoff. The election campaign has turned nasty this month, with dual scandals implicating both Santos and Zuluaga — and both of them involve the nasty intersection of politics and illegal drugs in Colombian politics. Two weeks ago, Santos’s campaign manager, J.J. Rendon, a Venezuelan political operative who’s something akin to the Karl Rove of Latin American politics, resigned after he was accused of receiving $12 million for his role in preventing the extradition of a handful of Colombian drug traffickers to the United States. Rendon didn’t deny intervening, but he denied accepting money. But the more serious scandal broke last week, when Zuluaga and his former campaign manager, Luis Alfonso Hoyos, were shown in video footage allegedly receiving a briefing from a campaign consultant, Andres Sepulveda, on the FARC talks based on illegal surveillance. Though Sepulveda has since been arrested, Zuluaga has argued the video is a fabrication. Although the scandal could ultimately result in criminal charges for Zuluaga, it’s even more damaging as a reminder of the civil liberties abuses of the Uribe era. Nonetheless, the accusations (so far) haven’t seemed to dent Zuluaga’s growing lead. So what’s going on? What explains Zuluaga’s meteoric rise? Everyone in Bangkok awoke Tuesday morning to the news that the Royal Thai Army had declared martial law, including the censorship of certain news outlets. The army is determined to restore peace and order in our beloved country as quickly as possible. I request that people from all sides stop their movements so that all can quickly enter the process that will bring about a sustainable solution to the problems the nation is currently facing. Announcements will be made later on to provide details for the rules and regulations under martial law. I urge the public to stay calm and continue their daily activities and work normally. The army is determined to quickly ease the situation. No one really knows what is happening right now in Thailand, but it’s a country with a history of coups and coup attempts. So the latest efforts of the creepily-named Peace and Order Maintaining Command (POMC) that Prayuth leads, on the basis of laws that undermine the rule of law and democracy in the name of military-imposed order, is ominous — even if Thai soldiers have so far taken a light footprint on the ground. 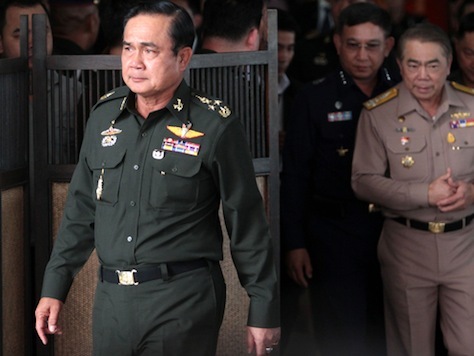 Prayuth, since assuming the commander-in-chief post in 2010, has generally been unenthusiastic about intervening in Thailand’s politics — he has previously relented from intervention, even during the tense days leading to February’s elections. Like most military officers, however, he’s no fan of the regime of former prime minister Yingluck Shinawatra who, until her court-ordered removal earlier this month, enjoyed a democratic mandate for government. Moreover, Prayuth is known as a hardliner within the military elite, and there’s no indication that he’s as neutral as he claims to be. With the imposition of martial law, Thailand’s politics could quickly deteriorate. That’s because the Thai armed forces have a long reputation of favoring the opposition Phak Prachathipat (Democrat Party, พรรคประชาธิปัตย์).